Now scroll down to Incoming Settings. You need to enter your inbound trunk's username and password. To work this out, login to your Gradwell control panel and click Phone Numbers (underneath the setup menu). You will see your inbound number along with the destination. We are interested in the section after IAX2/ and before the destination IP address. Your username is before the colon, and the password is after. In the example image above, the username is gradwelltest and the password is mypassword. n.b. if you wish to change these values simply click the edit link. Make a note of your username and password and return to Elastix. In the USER Context field enter your username. In the USER Details field enter the following, replacing [password] with the password from your control panel. 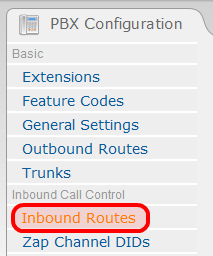 You now need to configure an inbound route so that Elastix knows how to handle received calls. From the left hand menu select Inbound Routes. Scroll down to Set Destination. This is where you decided where you want to direct incoming calls to this number. Select it using the dropdown box and click Submit to save your changes and complete the setup.